Book hotel rooms online with us at Marina Club Lagos Resort Hotel at the lowest rate, guaranteed. 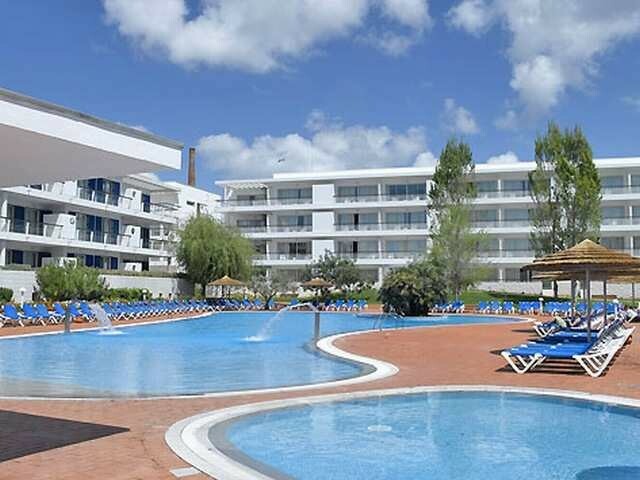 Get a holiday discount room rate at the 4 Star Marina Club Resort & Spa located in the Lagos in the western Algarve. The complex has 141 holiday self-catering modern studios, one and two-bedroom apartments providing accommodation from two adults to four adults. The Marina Club Lagos Resort & Spa apartments mainly face the boat Marina or the pool area and are within comfortable walking distance of the centre of historic Lagos. The modern well furnished apartments all are air-conditioned and are equipped with kitchenettes or kitchens with a washing machine, balconies, satellite TV, direct dial phones and a safe. Marina Club Resort facilities include a Health Spa providing treatments and massages, an indoor pool, a Fitness Centre, a sauna and Jacuzzi, a restaurant, a bar, a large outdoor swimming pool and free Wi-Fi in public areas. Free parking is also normally available in an underground garage.